Green Bean Bundles are my new favorite party food/special holiday recipe? What makes this recipe special? Bacon. While bacon can make almost anything special, when you add some brown sugar to it, this will send you into a new level. 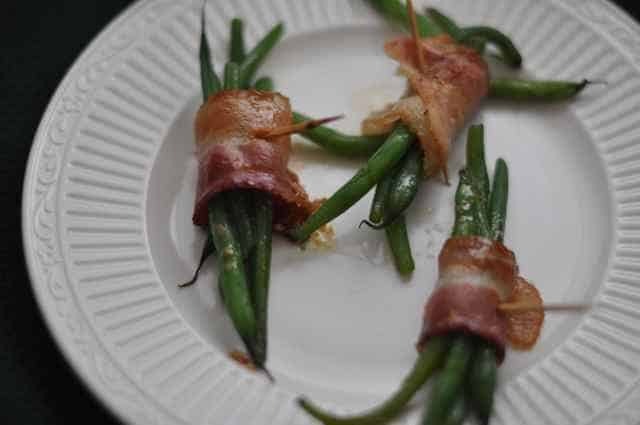 Crispy bacon wraps tender young green beans and there is a sweet, buttery, tangy sauce that is poured over these while they cook. I swear, I think these should be my newest party food. I love these like a party food. What I like about this recipe is that you don’t have to be exact in the measurements, so go with what you have. Every time I see a recipe with lots of bacon I am reminded of a story. I had just brought my former fiancee home to meet my mother and step-father for one of the first times. Michael apparently loved liver and onions, a food I can’t stand. My Mom was thrilled that Michael said he loved liver and onions. Now the way my Mom makes liver and onions is about equal amounts of liver, onions, and well bacon. I think Michael was amazed at the amount of bacon that went into my Mom’s liver and onions. Green beans never taste so good! Fresh green beans are wrapped with bacon and a special butter sauce is poured over them. Wash green beans and carefully lay them on a paper towel and place them in the microwave to steam for about 90 seconds. In a large skillet saute bacon until it is almost done, undercook the bacon, you will finish cooking the bacon in the oven. Meanwhile in a small saucepan combine butter, brown sugar, Worcestershire sauce, garlic powder, and cayenne pepper, and mix until the butter and brown sugar has blended. Take about 5 to 6 green beans and bundle them together by wrapping one piece of bacon around the green beans. Secure bacon with a toothpick, and place into a 9 x 13-inch baking dish. Repeat until you run out of green beans or bacon. Drizzle a couple of teaspoons of the seasoned butter over each green bean bundle. Bake green bean bundles until the bacon is crisp. Browning of the bacon should take about 10 - 15 minutes. Before serving, drizzle the remaining sauce over the bacon bundles. I’ve made this the last two years for the Holidays. My Families new vegi favorite! I have made a similar recipe for years but baste the bundled beans with sweet BBQ sauce. You wouldn’t eat those vegetables? do you think it would work to bake the bacon til underdone instead of frying it? That’s what I did to my bacon. If you watch the video, you see me baking the bacon. This looks really good! I think I’ve just discovered a new way to get hubby to eat green beans! Thanks for posting this. I have been making this recipe for years!! I’m curious–where did you find this recipe? I tried this for the first time over the Holiday’s it was served at Debbie Nelson’s house. Very good stuff here! I LOVE these! I had tried these at Christmas and they are delicous. Thanks for posting them. Now I have the recipe and can make them myself.